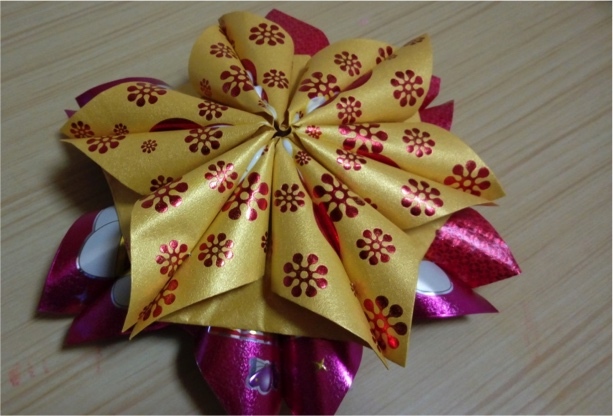 Gong Xi Fa Cai | Upcycle those red packets with our crafts! It’s that festive time of the year again we know all too well. Crowded supermarkets, massive sales, the distinct smell of bak kwa you either love or hate, and of course the familiar CNY jingles we grew up with buzzing through speakers everywhere. If the hustle and bustle of CNY preparations are not really your speed however, this post might just do the trick for you! It saves you money and also – I should add – is very therapeutic. After all, everyone has ang pows (aka lai see aka hong bao) lying around the house somewhere. 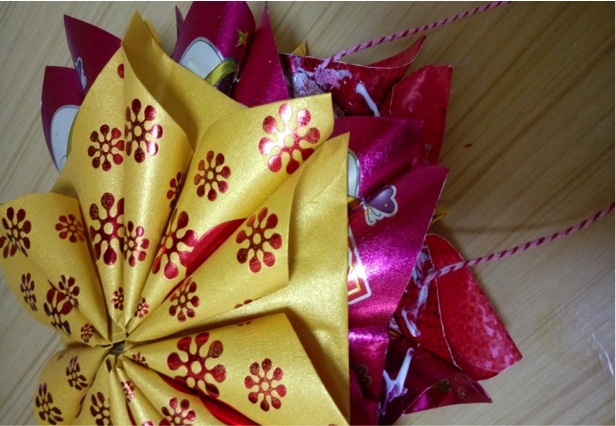 So, instead of heading to Chinatown this year to get your festive decorations, why not upcycle your festive red envelopes into these cool crafts? This basket does indeed come in handy (pun intended) when you have relatives visiting and you want to impress them. Not only does it keep all your snacks in one place but it will have your guests swooning and wanting to know how you made it. It can even double up as a basket to keep mandarin oranges in your car! No one, I believe, ever grows out of the novelty of fortune cookies. Make these DIY ones for your guests and they will be more than tickled! You can also place affirmation notes inside for yourself and your family members to read each morning. A certified awesome way to start the day! Indeed, what is Chinese New Year without the standard pineapple motifs that we have become so accustomed to seeing during the festive period? If you, like me, are bored of all the same pineapple-themed decorations available at the store, this craft is perfect for you. 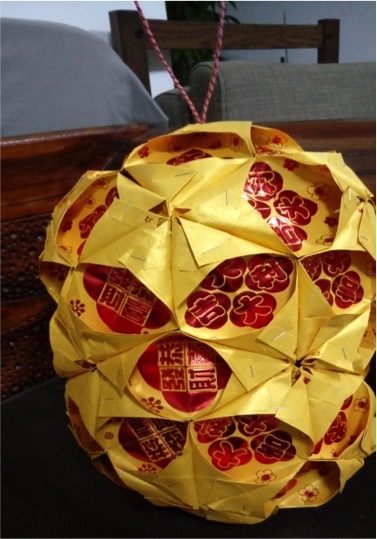 Chinese New Year decorations are definitely not complete without a classic lantern and this lotus flower one, I think, is a great one to have in your house. It is simple but still mesmerizing to look at especially when there is a light breeze blowing. These crafts are simple to make and the best part is that all the materials needed are things that you probably have around the house already. Fuss free, family-friendly and relaxing to do, I highly recommend that you give these a go and I hope you enjoy them as much as I did. Happy Chinese New Year! Gong Xi Fa Cai! 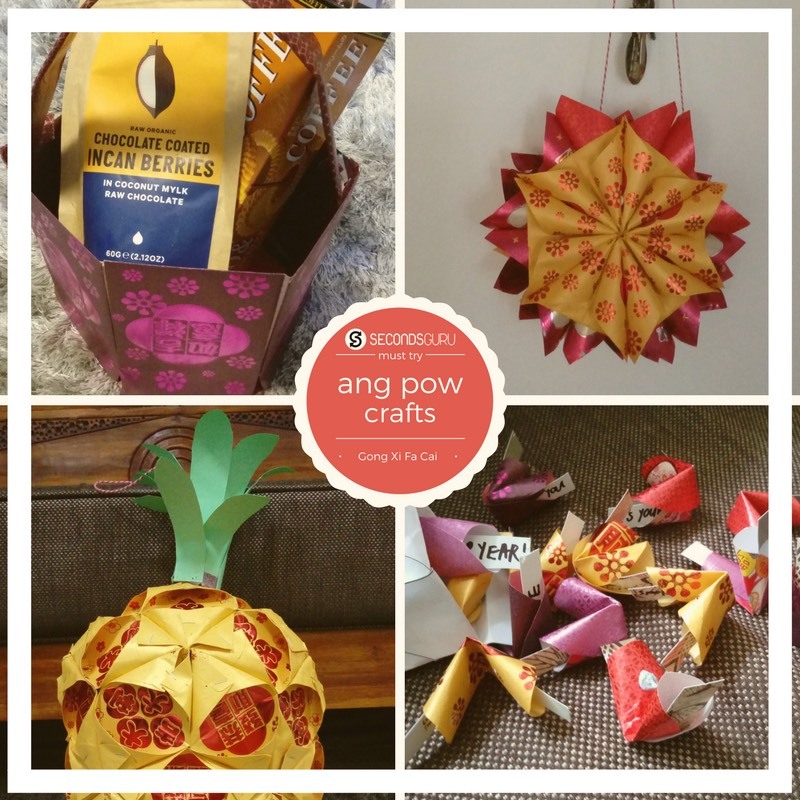 6 Ang pows, cardboard (2 A4 sized pieces should suffice), colored Paper (1 A4 piece), scissors, tape, pencil, and a ruler. Note: If you want to be able to carry the basket around, thick cardboard is necessary to sustain the weight of whatever you wish to place inside. Line up the back of the ang pows and tape them together along the long edges. 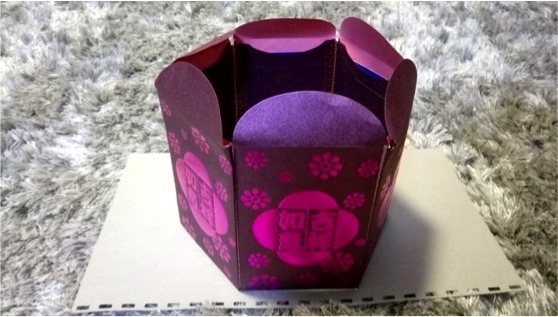 Using the ruler, measure the dimensions of the ang pow and then cut out a slightly smaller sized piece from the cardboard. 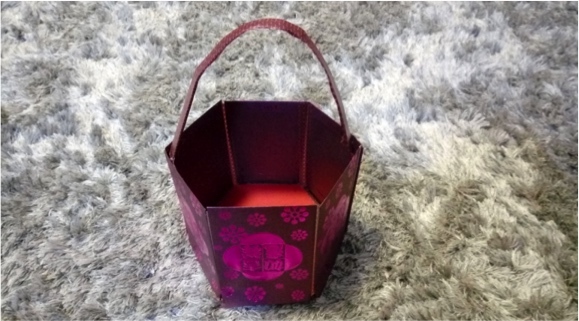 Make a total of 6 pieces and insert each one into an ang pow so as to give your basket more structure and sturdiness. 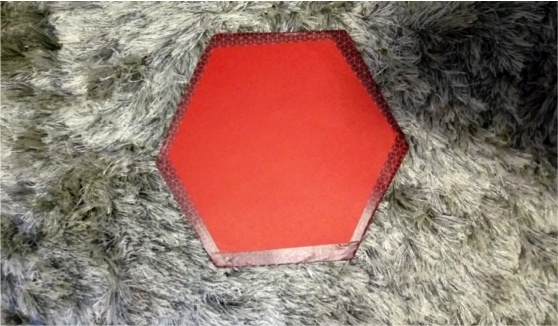 Place the ang pows upright in a hexagonal shape and trace this out onto a cardboard. Cut the traced shape out and wrap it with red colored paper using tape. 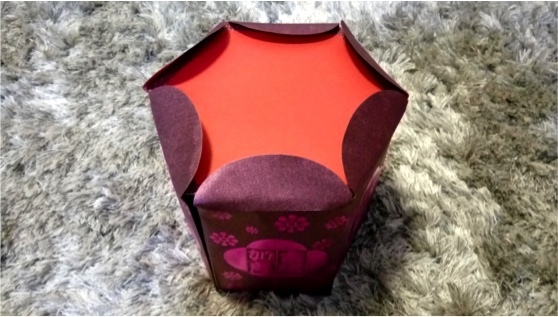 To create the base of your basket, place the hexagonal cardboard cut-out just under the flaps of your ang pows and then secure it down with tape. Cut along the edge of your cardboard about a 3cm wide strip for the handle. I put tape on the handle to make it look more presentable. Attach the handle to the basket with tape and voila, you’re done! 5 Ang pows (Each ang pow yields about 3 cookies so adjust this based on how many you need), a round object for tracing the circular shape of a cookie, craft paper, blue tack (optional), scissors, penknife, ruler, pencil, writing pen/marker. Open up the ang pows at the sealed edges using a penknife and then with the round object, trace as many circle shapes as you can on it. Next, cut these circle shapes out and set aside. To make the fortunes, cut a small length of your craft paper about 2cm wide and just a little longer then the diameter of your circle. 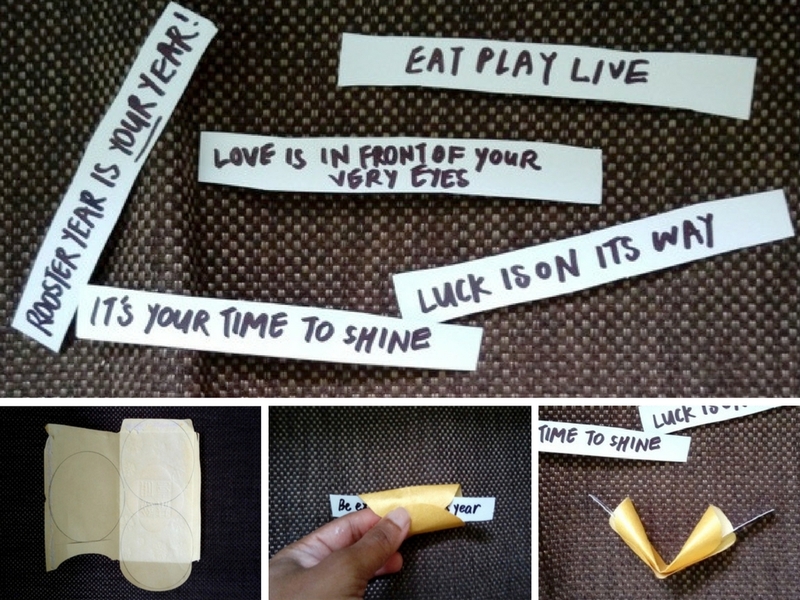 Place the fortune in the center of the circle cut-out and then bring together the top and bottom parts of it. While holding the top and bottom parts of the circle, create a sort of dent in the middle and pinch it down. If you want to make a ‘tighter’ cookie, you can add blue tack to the middle and stick the two sides together. Otherwise, repeat steps 3-5 for the rest of the cookies and you are done! Enjoy! 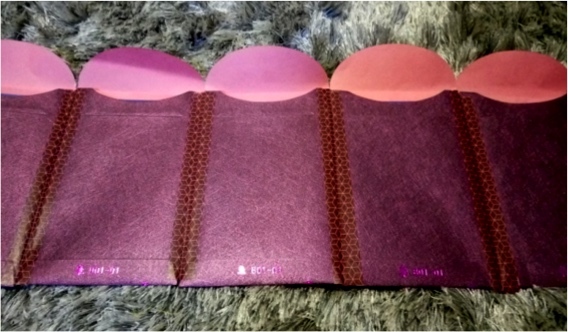 Fold your ang pows in half along both the short and long edges. 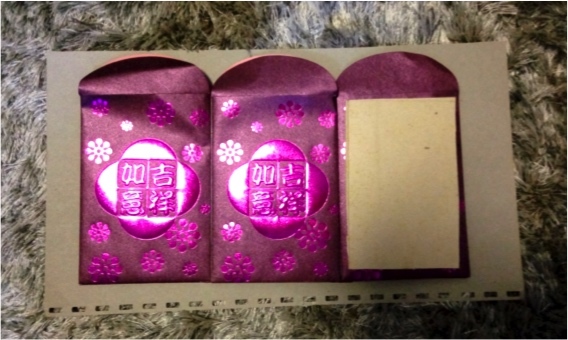 Then using the fold lines as a guide, fold all 4 edges of the ang pow inwards. Repeat this for all 45 ang pows. When all the edges are pressed down, your ang pow should form a diamond shape. Staple the edges neatly together twice or thrice in a row as close to the fold line as possible. Practice this way of stapling throughout all the steps so that you will be able to do step 7. Use a total of 5 ang pows for this step. Next, we are going to use another 5 ang pows, but this time attaching them in a horizontal manner as seen in the picture. 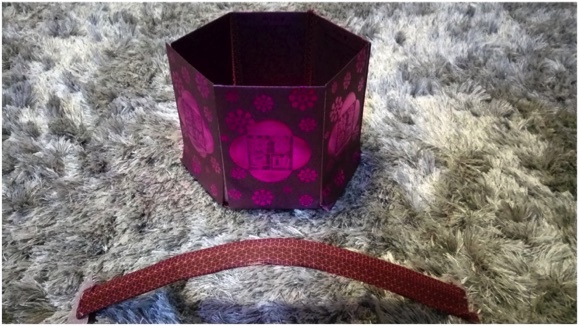 To make the handle of the lantern, first poke a hole into a small piece of cardboard (cut from the tube) with a pair of scissors. Then, cut some string, fold into half, and thread it through the hole, making a knot right below the hole. Pull the thread through the top centre of the half formed pineapple. To continue with the body of the pineapple, we need to staple two ang pows together by their top edge as we did in the beginning. Make five of these pairs. We have to join these to the top of the pineapple. Now repeat all the steps excluding step 3 to make the bottom of the pineapple. You should have two halves like this. Just for the top half only (the one with the handle), we are going to attach the last 5 ang pow pieces horizontally. Next, combine the two halves and then fold all the edges together and staple. Cut the green colored paper into roughly about 12 cm by 3cm sized leaves and trim down the cardboard tube into about a 6cm long. You will need about 9-12 leaves. Tape down the leaves onto the tube. Then use your finger or a pen to curl the leaves like so. Thread the string of the handle through the tube and secure the tube onto the pineapple with white craft glue. 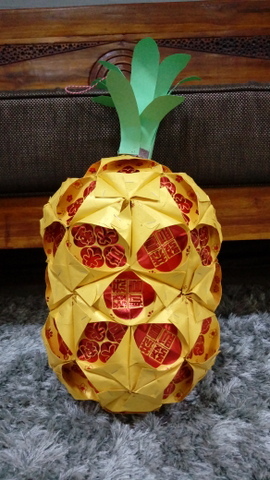 There it is – your very own pineapple lantern, good looking enough to eat! Using the small ang pow first, fold it into half and using the fold line as a guide, take the edge and roll it inward toward the fold line till it forms a cone shape. Staple on the inside of the cone to secure it down. 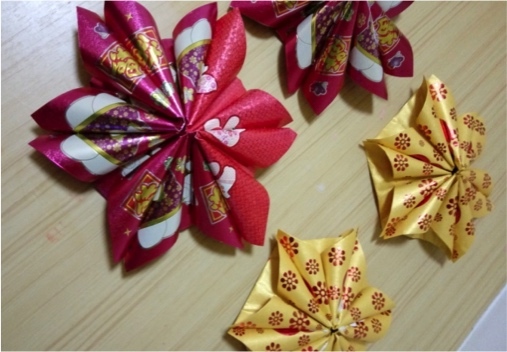 Make 6 of those double-cones and staple all of them together so that you get a sort of lotus flower shape. Repeat this for all the remaining ang pows until you get a total of two small and 2 large lotuses. 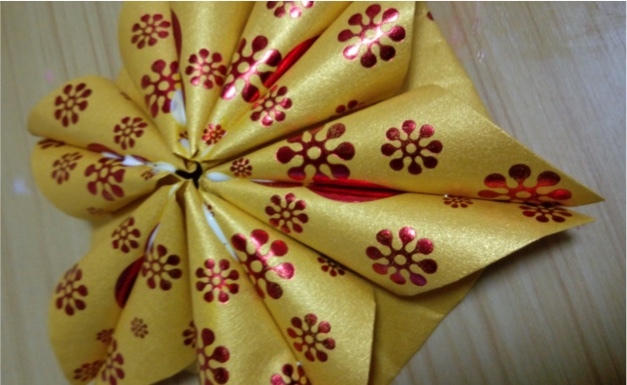 Close up the gaps in your flower with craft glue. 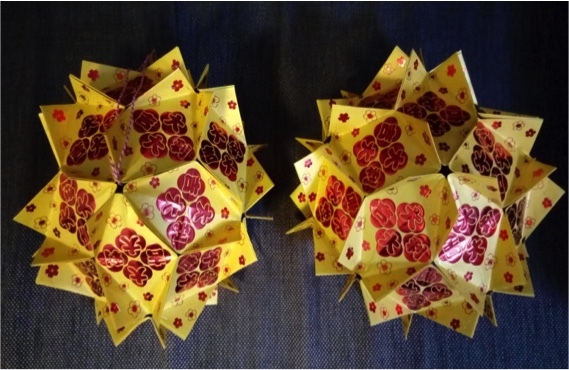 Place the small lotus on top of the big lotus and secure together with glue and staples. Cut a piece of string for the handle and secure onto the underside of the big lotus with staples. Join the two halves together with glue and staples and let dry. 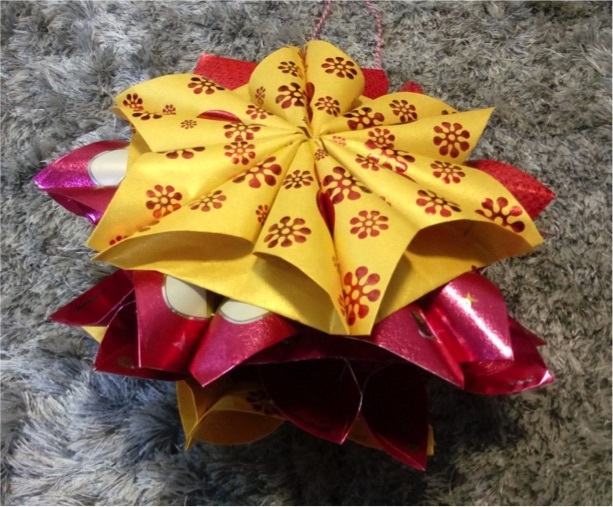 Your very own flower lantern is ready to hang and be admired! Preya is currently completing an English degree at Nanyang Technological University (NTU), Singapore. When not buried in readings, she likes to try out vegan recipes at home. Our guest authors come from all walks of life - from green warriors sharing expert advice to enthusiastic readers sharing tips and DIYs. 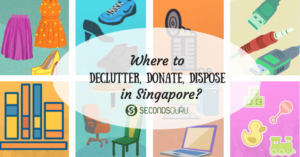 If you would like to contribute and pen for us, drop us an email at blog@Secondsguru.com! 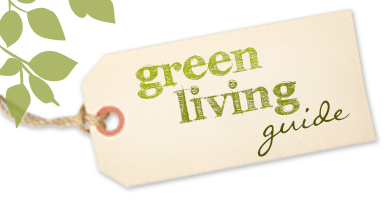 Are you trying to live a greener lifestyle? Sustainable living can be a fun, creative and practical goal for all. Let us be your guide when you search for eco-events, information resources, sustainable brands, inspirational stories, or anything green in-between! Our story, and where you fit in. The Worldwide Vegan Bake sale promotes Vegab food worldwide by mobilising people around the world to bake vegan treats and raise funds for charitable causes. Since 2009, this coordinated project has raised more than $440,000 across 27 countries and 6 continents. The Worldwide Vegan Bake Sale is open to any individual, group or commercial establishment. You don’t have to be vegan or an animal advocate to participate. As long as the treats and other materials used do not contain animal products, like eggs or dairy, you are welcome to join in! It’s time for the Fashion Revolution Week, a global movement calling for a fairer, safer, cleaner, more transparent fashion industry. The movement was born after the Rana Plaza tragedy which occurred on April 24, 2013, when 1,138 people died and another 2,500 were injured in a building collapse in Bangladesh, making it the fourth largest industrial disaster in history. Have you ever wondered who made your clothes, how much they’re paid, and what their lives are like? Our clothes have gone through a long journey before they hit store shelves, passing through the hands of cotton farmers, spinners, weavers, dyers, sewers and others. Approximately 75 million people work to make our clothes, out of which 80% of them are women between the ages of 18 and 35. However, the majority of the people who makes clothes for the global market live in poverty, unable to afford life’s basic necessities. Many are subject to exploitation; verbal and physical abuse, working in unsafe and dirty conditions, with very little pay. Globally, people and organisations have come together to campaign for a more accountable industry, where dignity of toil and a safe environment are a standard and not an exception. 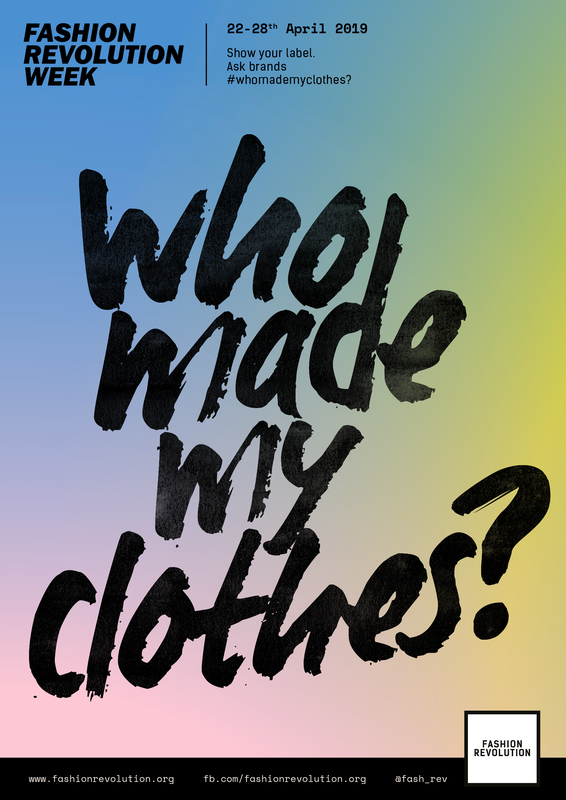 Take action this Fashion Revolution Week by asking brands #WhoMadeMyClothes. 22 Apr Future on Our Sleeves – Exploring Sustainable Fashion: A panel discussion with a clothes swap and free drink. For more details, click here. 25 Apr Movie Screening – Udita (Arise): A film about the struggles of women in the garment industry. It’s free admission! To register, click here. 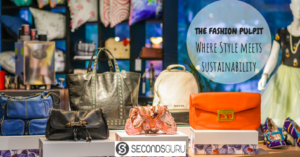 27 Apr Fashion Revolution Day SG: An entire day filled with multiple events at The Cocoon Space at Design Orchard, highlighting the importance of respecting people and environment in fashion. Check out the full list of events here. One of the pillars of fashion sustainability is supporting artisans through fair pay. Get a front seat to appreciating – and learning – the artistry and diligence behind traditional craftsmanship. Kala Tarang presents workshops on 3 Indian embroideries – Lambani, Ahir Mirrorwork and Meghwal Patchwork Applique by traditional artisans led by Laila Tyabji. 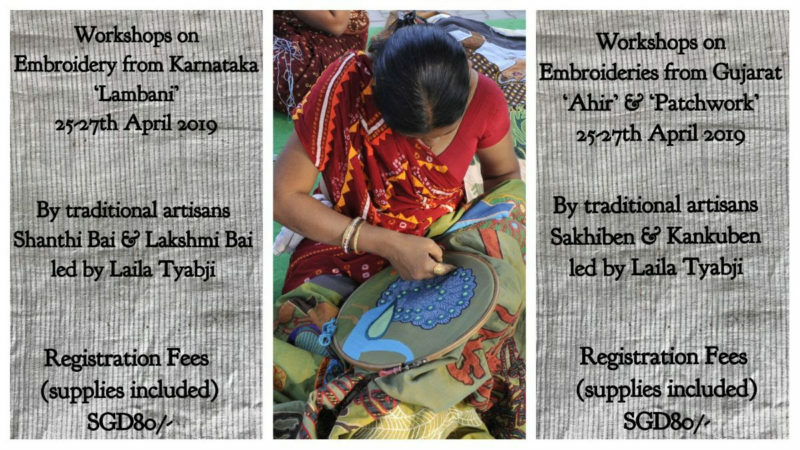 Shanthi Bai and Lakshmi Bai – 2 artisans from Sandur Kushal Kala Kendra, an NGO working with traditional Lambani women in the Bellary District of North Karnataka, will conduct the hands-on workshops under the supervision of Laila Tyabji, herself a passionate embroiderer. Shanthi (winner of the National Master Craftsperson Award in 2001) and Lakshmi are both experienced embroiders who have conducted workshops around the world. They will take the participants through the basic stitches and every participant will have a practice run on a piece of cloth with printed motifs. After the participants are comfortable with the stitches, they will move onto creating a final embroidery piece to take home. All 3 workshops will be conducted concurrently so if you wish to attend workshops for more than 1 embroidery, you will need to register for different dates. Each workshop will be completed in 1 session (3 hours). For each embroidery, the same workshop will be repeated on the 3 days. All materials will be provided at the workshops. Email sangeeta.roy@kalatarang.com or call (+65) 92361451 for details about registration. When you give, you get so much more in return! Small items that we don’t even take notice of can make a huge difference in the life of another. And here’s an opportunity to help those who need it the most. Blessings in a Bag are hosting a donation drive for specific items for specific areas. Please ensure that the items you donate are new or like – new. 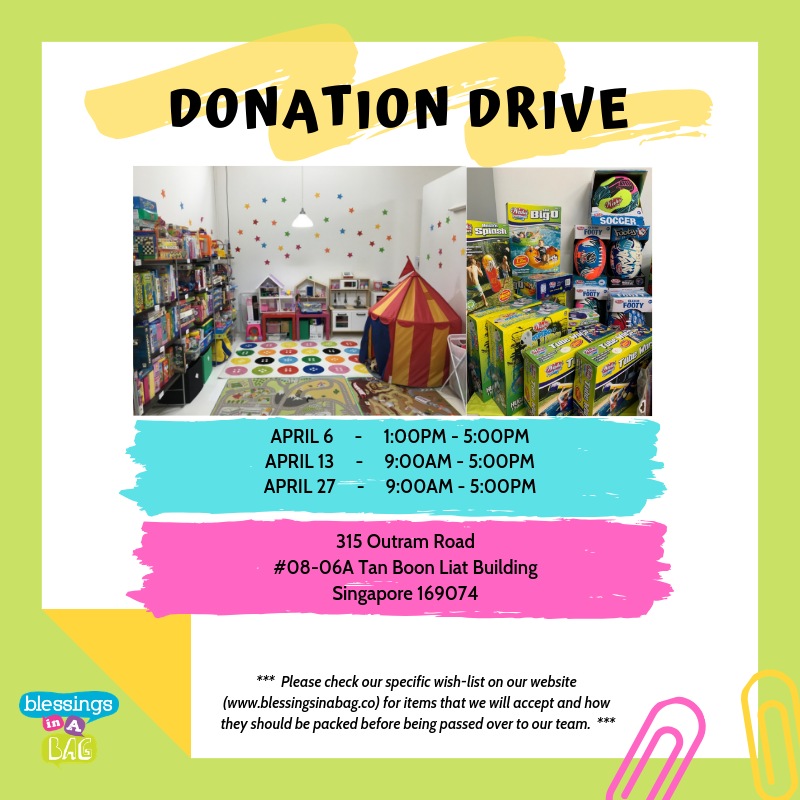 There is a lists of items that they need available here; do take a look and donate accordingly. Blessings in a Bag work towards empowering the youth in Singapore so that they may grow into resilient, compassionate and emotionally intelligent leaders who uplift their communities. 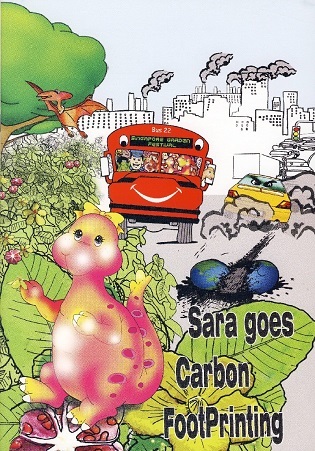 To celebrate Earth Day, Sara and her friend Rana the Frog, will teach the young budding environmentalists about carbon footprints and what they can do to make a difference. The participants will learn how to reuse and recycle objects from home and nature. Organised by National Parks, this event gives the little ones a chance to get up close and personal with nature. Spend a day on the farm, enjoy hands on experience of harvesting and be a part of the farm to plate process to appreciate the hard work that farming is! Green Circle Eco Farm is organising a tour of their farm, followed by a workshop to make Nasi Ulam that will be your lunch. Bus transport at Kranji MRT Station Taxi stand at 8.30am. Hands-on harvesting and making nasi ulam and blue pea flower tea. Bring home some stem cuttings and seeds to grow. Farm tour need minimum 30 participants to start. Registered participants will receive a Whatsapp reminder to make the payment on or before the 25th of the month. Payment NOT REFUNDABLE, but participant can replace farm tour on another date or by another person to participate. 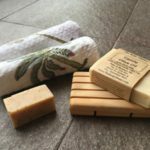 Green Circle Eco Farm is an organic farm in Singapore where you can do tours/workshops as well as get freshly harvested vegetables and fruits delivered to your doorstep. Spend time doing good on the weekend, join a beach clean up organised by Little Green Men at Sungei Seletar. 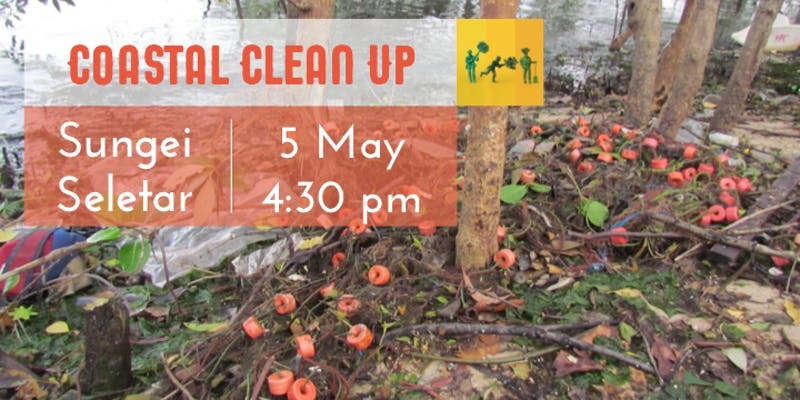 Kids are welcome; Do bring tong for them for the clean up! The organizers will provide adult gloves, trash bags and data cards but feel free to bring your own. If you believe that sustainability matters then this session is where you want to be. 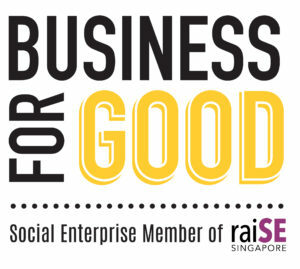 Hosted by The Hive Singapore, this event has a marketplace, a panel discussion and workshops all put together. Join this guided walk at Changi Beach to get a glimpse of all the marine life – sea grass, sea cucumber, sea stars and much more – that inhabit the waters around the Singapore coast. 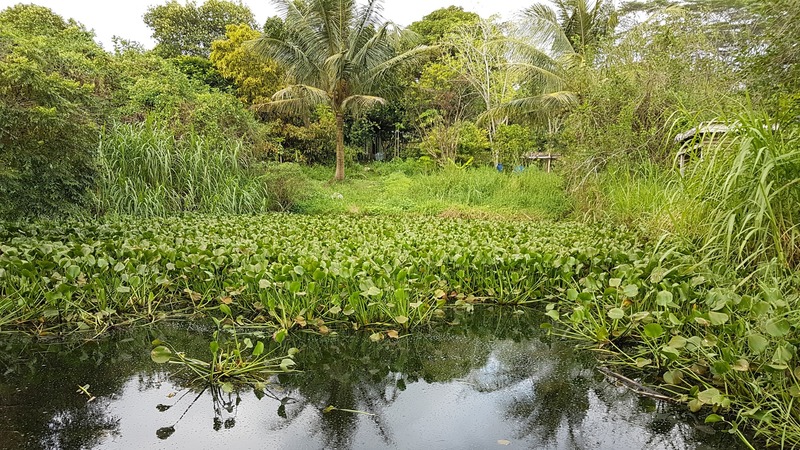 Organised by Ulu Singapore-Guided Nature Walks, all you need is a pair of boots and wait for the opportunity when the tide is low to go exploring! The programme schedule may change or get cancelled due to unfavourable weather. There will be no refunds. For safety, only covered footwear allowed. You will be able to rinse your shoes post the walk. Further details regarding the event will be mailed to you a day or two prior. Spend your weekend buying locally sourced fresh grown produce and meeting those who grow them. 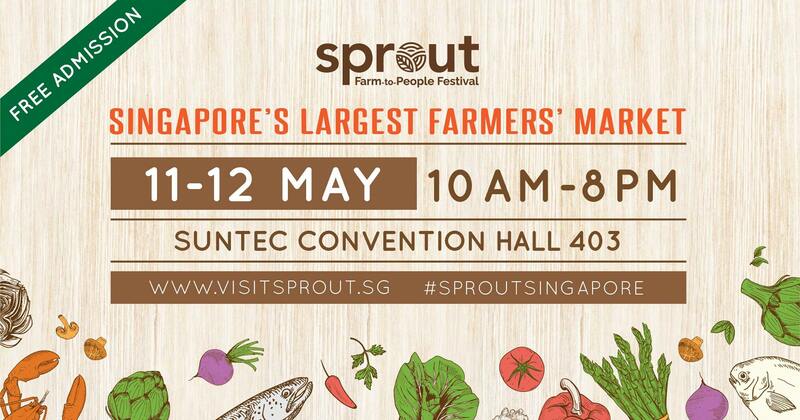 Sprout 2019 – The Farm to People’s Festival is back for it’s second edition this May. The festival aims to bring together farmers, food producers and consumers – all learning more from interacting with one another. Price: Free Admission. Register here (Scroll down to the bottom of the website) to stand a chance to win a goodie bag! Sign up for our monthly newsletter. 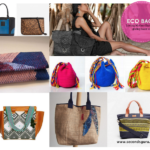 Get alerts on eco-events, be inspired by upcycled projects, find sustainable brands. #RewearIt | DARLINKS founder Priya Daniel shows you how to share your wardrobe with your mini fashionistas!